On March 14, 2011, just before I took over this column from Mark Tré, he wrote an article on cruise ship registry that has been one of the most widely consulted in the whole Cruise Examiner series. In view of recent events, such as last year’s reflagging of Cunard’s three Queens to Bermuda, the dispute over whether the Deutschland would be reflagged to Malta (she has remained on the German register), and other questions about the effect of cruise ship registry on the industry (or vice versa), we repeat that column here. Other than the switch by Cunard to Bermuda and the delivery of new ships over the past year and a half, Mark’s findings remain absolutely the same today. At one time, passenger ships were registered in their country of operation, but those days are long gone. As far back as 1922, William Harriman registered the ex-German Reliance and Resolute under the flag of Panama and, among other things, operated world cruises with them. The chief reason for doing this was to avoid Prohibition as these two ships were at the time American-owned. In 1948, Edward Stettinius, former Secretary of State under President Franklin D Roosevelt, founded the Liberian registry. 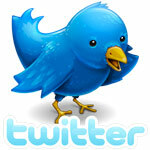 Later followed others such as the Bahamian and Bermudian registers and more recently, Malta and Portugal. Meanwhile, a number of countries, particularly Italy and the Netherlands, have seen cruise ships return to their native registries. Today, for something a little different, we have a look at cruise ship flags if registry. By far the most popular flag for cruise ships today, and one that has gained from both Liberia and Panama in recent years, is that of the Bahamas, formed just over thirty years ago and now numbering 59 major cruise ships under its flag. The large carriers are present, but most notably Royal Caribbean International, whose 22 ships are all now under Bahamian flag, a flag that so closely resembles that of Denmark that it is a wonder that that country did not sue the Bahamians when it was first introduced. Following Royal Caribbean International, which today operates about a third of the Bahamian-registered cruise ship fleet, comes Norwegian Cruise Line, with ten Bahamian-flag ships. The one exception is the US-flag Pride of America. Also registered in the Bahamas are six ships from Carnival Cruise Lines and five from Seabourn, numbering 11 ships from Carnival Corp & PLC brands. Apart from these major participants, who account for over 80% of the Bahamian-registered cruise fleet, there are Hapag-Lloyd Cruises, with four ships, Regent Seven Seas with three, and a number of other one-or-two-ship companies. There was a time when many cruise ships flew the Panamanian flag at the stern but today the Bahamian flag has taken first place. This now leaves two major Panamanian-flag cruise ship operators, Carnival Cruise Lines and MSC Cruises. Carnival Cruise Lines started under Panamanian flag, with its Mardi Gras in 1972, and has remained largely loyal. While it did go into a mix of Panamanian and Liberian-flag ships, in more recent years the Bahamian flag has displaced that of Liberia. Even today, Carnival’s most modern ships, 17 of them, fly the Panamanian flag, while half a dozen of its older ships use the Bahamian. [Ed. note: Carnival Breeze, the line’s newest ship, is also registered in Panama]. The other Panamian-flag operator is MSC Cruises of Naples, a line that at one time did contemplate the Italian flag, but has not made the move so far, MSC is of course part of the Mediterranean Shipping Company of Geneva, one of the world’s largest container lines, which keeps the majority of its fleet registered in Panama. Bermuda has offered an offshore registry for British-owned ships since 1974 and its flag is the British red ensign. For many years, this ensign carried the Bermuda coat of arms in the fly, as does the Bermudian flag today, but now the merchant flag that is used is the “undefaced UK Red Ensign.” This meant that when P&O transferred its ships’ registries from London to Hamilton, Bermuda, it did not even have to buy new flags for its ships! Today’s Bermudian cruise ship fleet almost all comes from this one source, what was once P&O Princess Cruises but is now part of Carnival Corp & PLC. The Bermudian-flag fleet thus numbers 15 ships from Princess Cruises and seven from P&O, forming a flag where Carnival Corp & PLC now has more presence than that of Panama. Whilst a good part of this fleet was once registered in London, one of the interesting marketing gimmicks that the Bermudian flag allows is that P&O and Princess can now, unlike under the British flag, allow masters to perform marriages on board. While the Bermudian flag is British, its registry has different legislation. This is, of course, a new source of onboard revenue for P&O. [Ed. Note: Cunard Line’s three Queens have since been reflagged in Bermuda as well]. In addition, UK-based Voyages of Discovery keeps its Discovery, a former Princess Cruises vessel, flagged in Bermuda. It is now some time since Costa Cruises returned to the Italian flag from the Panamanian, but with 14 ships registered there it is a significant influence. In fact, when one adds the eight ships operated by German subsidiary brand Aida Cruises, we have a total od 22 ships, an equally important fleet to that operated by sister brands P&O and Princess under Bermudian flag, and yet a third sphere of influence for Carnival Corp & PLC. It is somewhat ironic that Costa Cruises now controls Aida Cruises as it brings the most important German cruise brand under Italian flag. They have not been German at any rate since the first Aida, as when P&O took an interest in Aida Cruises the ships went to British flag for a while. What is even more ironic, however, is that in order to travel on one of these Italian-flag Aida ships one must be able to speak German! The end result of this is that the German flag today retains only one important cruise ship, Peter Deilmann’s Deutschland, with the balance of the German fleet being registered in the Bahamas (Hapag-Lloyd) or Malta (TUI Cruises). While MSC Cruises, whose ships remain registered in Panama, is still missing, there is one rather interesting addition to the Italian cruise fleet, in that Plantours & Partners, now owned by Venice-based Ligabue, transferred its Vistamar from Spanish to Italian registry some time back. The Maltese flag, a fairly recent one for cruise ships, has been taken up in a big way by Royal Caribbean Cruises. Although its main brand, Royal Caribbean International, uses the Bahamian flag, four of its other brands, Celebrity Cruises, Azamara Club Cruises, Pullmantur and TUI Cruises, are now the mainstay of the Maltese registry. Pullmantur only in recent timesy moved its seven-ship fleet from the Bahamas to Malta, lifting the number of Maltese-flag cruise ships to 19 in the process. These brands are followed by Louis Cruises, who intend to add more ships to the Maltese flag in the very near future when they are trabnsferred away from the now-very-expensive Greek flag. P&O Cruises Australia also keep the Pacific Sun registered in Malta. [Ed. Note: this ship has since been sold for operation in China]. For many years, Holland America Line left the flag of its home country the Netherlands for Panama and the Bahamas, but today its whole fleet of 15 ships has been returned to its land of origin and registered in Holland. While there was talk at one time before they went out of business of Royal Olympic transferring their ships to Dutch flag, the basis of the Dutch cruise fleet today remains Holland America Line, yet a fourth Carnival sphere of influence. Not only that, but their Eurodam was named by Queen Beatrix in 2008 and Nieuw Amsterdam was named by Princess Maxima last year (With Queen Elizabeth II having christened the new Queen Elizabeth last year, Micky Arison seems to meet a lot of Queens these days). One flag that has come almost out of nowhere in recent years is that of Portugal, through its offshore registry in Madeira. In addition to the five-ship fleet of Lisbon-based Classic International Cruises, as of last year it also counts among its number the four-ship fleet of Iberocruceros, yet another brand of Carnival Corp & PLC, which now gives Portugal a fleet of nine cruise ships. A net loser over recent years, however, is the UK, which until recent times numbered the whole of the P&O fleet plus most of its sister Princess Cruises ships, under its flag, Today, however, it is left with the three Cunard Queens and one small Princess, the Hebridean Princess, that the Queen has in fact now chartered twice, plus three other cruise ships. Ironically, the three other UK-flag ships are the three ex-Sitmar ships that now form part of P&O Cruises Australia. So now we have P&O’s UK-flag ships sailing from Australia while the UK is served by its Bermudian-flag ships! The fourth P&O Cruises Australia ship is flagged in Malta. The three Cunard ships and three P&O Australia ships nevertheless form another sphere of influence for Carnival Corp & PLC once again! [Ed. Note: The Cunard Queens have since been reflagged to the Red Ensign of Bermuda. More than half of the world’s mega-yachts also now fly the Red Ensign, with registers in localities such as Bermuda, the British Virgin Islands, the Cayman Islands, Gibraltar and the Isle of Man]. The Marshall Islands is new to cruise ships, but the four ships of Oceania Cruises now call those Pacific islands home. Elsewhere, Japan also counts four cruise ships from its Mitsui OSK, NYK and Venus brands the United States continues to see the Pride of America, the remaining rump of what was once a three-ship fleet, under its flag. It is somewhat surprising that the Norwegian flag has totally disappeared from cruise ships, where even a few years ago Fred Olsen Cruise Lines still used it. Today, even with an open registry that allows offshore Norwegian shipowners to avoid heavy Norwegian taxes, the Norwegian flag has been relegated to coastal status with the Hurtigruten fleet, which is not counted here. Names such as Norwegian America Line, Norwegian Cruise Line, Royal Caribbean Cruise Lines, Flagship Cruises and Royal Viking Line have all disappeared, being bought out over the years by British, Malaysian and American investors. Important Norwegian ownership does remain, however, as in addition to Fred Olsen, Anders Wilhelmsen, along with the Pritzker and Ofer families, remains a major shareholder in Royal Caribbean Cruises. It appears that the Greek flag too is about to disappear from cruise ships, with the only major operator still flying it, Louis Hellenic Cruises, applying to leave the flag because of huge pension costs now being demanded by local seamen’s unions and potenitally an austerity-driven Greek government. None of the old Greek names are left, among them Chandris, Efthymiades, Epirotiki, Goulandris, Kavounides, Nomikos and Typaldos, all now long gone from the scene. Now, only a few months later, we find that Louis is contemplating giving up the Greek flag in protest against these demands for onerous pension fund contributions and have applied to have the Louis Cristal and Louis Calypso moved to Malta, where a number of their other ships such as Louis Majesty are already registered. Louis Emerald may also follow. The savings from switching from Greek to Maltese flag are reported to be in the order of Euros 300,000 per ship per month and the move has more or less been brought about because vessels flying other European flags will now be able to compete with the Greek flag, thus offering Louis Cruises no protection. Louis, meanwhile, would still employ Greek masters, senior officers and senior engineers even under the Maltese flag. If this happens it will be a sad day for Greece and the first time in many years that no important cruise ship will have flown the Greek flag, long so emblematic of professional seafarers. For many years, the flag of Liberia, one that somewhat resembles that of the United States, was popular with American owners. Carnival Cruise Lines, Royal Caribbean and Celebrity all used to operate some of their fleet under Liberian flag but since the dictatorship of Charles Taylor, who was removed from power in 2003 and has just been tried for war crimes, all cruise ships left the Liberian flag. Along with Panama, Liberia used to be the other chief flag of convenience but we have now seen new ones arrive such as Malta and the Marshall Islands. Indeed, the Marshall Islands program was originally administered by the same people that operated the Liberian register. Meanwhile, Taylor’s trial was completed on Friday and a verdict is now awaited. Most people forget that it was President George W Bush who was responsible for removing this dictator. Although Liberia is now led by Africa’s first elected woman president and it retains a high number of cargo ships under its flag, it is very unlikely to be seen flying over cruise ships again, at least in the near future. 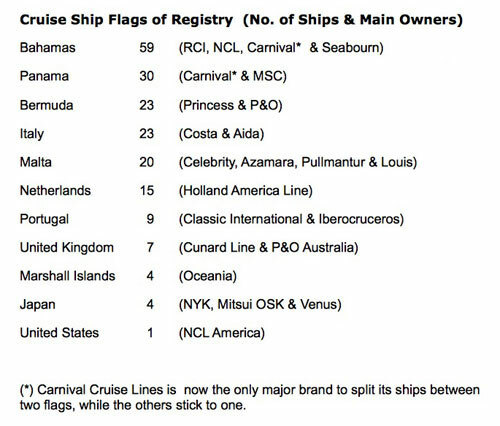 All in all, with cruise ships flags of registry seem to be a very fluid subject, but it is interesting that individual fleet policies are much more homogeneous now than they were a few years ago, when different parts of each fleet were registered under various different flags. Carnival Cruise Lines seems to be the only brand that still operates a two-registry policy.